Glucosamine Sulphate 2KCI (from Shellfish), Cellulose, Modified Starch, Tablet Coating, (Hydroxypropyl Methylcellulose, Glycerine), Anti-caking Agents (Silicon Dioxide & Magnesium Stearate), Stearic Acid. Take 2 tablets daily with a meal, or as directed by a practitioner or pharmacist. 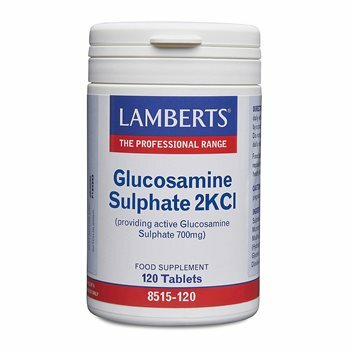 Lamberts chose to use the sulphate form of glucosamine becasue this is the form most often used in scientific studies. This product does not contain sodium or salt (NaCI). Have only been taking these for a couple of weeks so can#t comment on any effects on my joints, but the tablets are easy to swallow and give a high enough dose to hopefully help keep my joints in working order. This is a very good price for tablets of this potency so I'm well pleased.